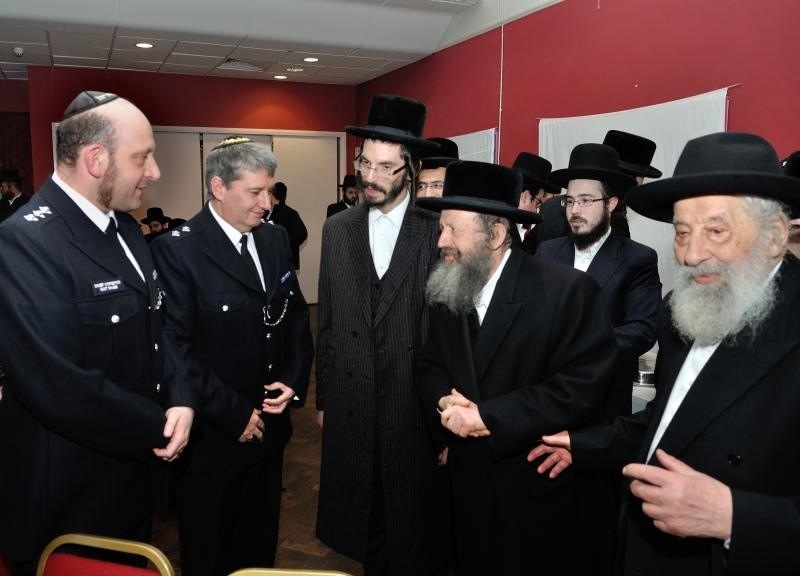 North London Jewish community leaders, activists and law enforcement representatives gathered last Thursday to celebrate Shomrim’s inaugural fundraising event and honor the many Awardees for their involvement in the relatively new organization. A large crowd of the community reserved the evening to pay their deep appreciation to the many local patrol security members and the Metropolitan Police Department for a close relationship in keeping the neighborhood safe. 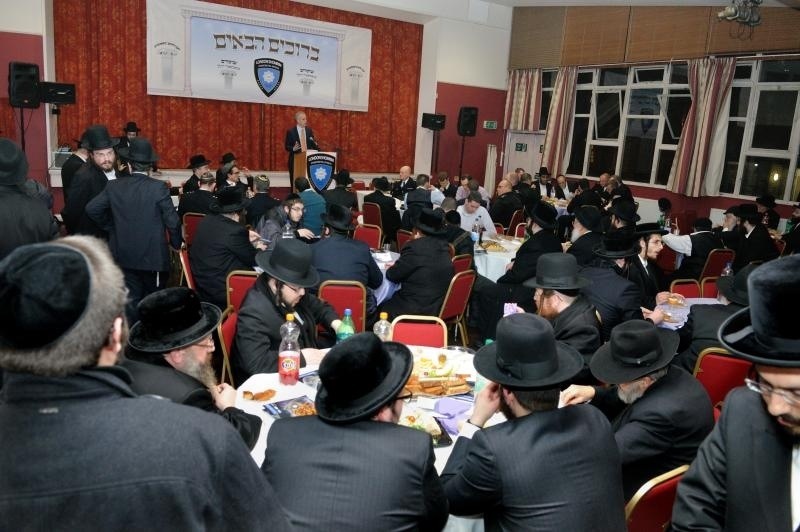 The evening was further graced by Rabbi Ephraim Padwa shlit”a and by the Rabbonim and Dayonim of the UOHC rabbinate and VIP’s. The SO20 had a fully operational stand in the foyer of the hall. SO20 Counter Terrorism Protective Security Command aims to help make London a safe place for the public and a hostile environment for terrorists by strengthening London’s protection. The Command is responsible for making sure there are adequate protective security arrangements in place for major events, crowded places and iconic sites. The specialist officers also work with the wider community and offer counter-terrorism security advice and guidance to the business community, public and voluntary sector including educational establishments, places of worship and others and it is made up of a variety of specialist units who together provide security and counter-terrorism co-ordination for London. The guest speaker of the evening was Rabbi Leibish Heller, a former Minister at Kinloss Gardens and an assistant to the Chief Rabbi – Rabbi Ephraim Mirvis, originally from New York, who is a well known orator and a dynamic speaker. An award ceremony was the highlight of the evening with the main recipient being the Borough Commander of Hackney Police, Chief Superintendant Mr. Matthew Horn. Mr. Horn was recognized for his readiness to engage with Shomrim, being at their disposal at all times and situations, offering assistance and support with matters such as providing training at the Station and arranging joint patrols. Lord Brian Paddick, a Lib Dems Life Peer in the House of Lords and a former police officer for over 30 years rising to the most senior levels of the Metropolitan Police at Scotland Yard, presented this special award and gave an insight of the recipient’s illustrious career at Stoke Newington and his committed assistance to Shomrim’s mission. 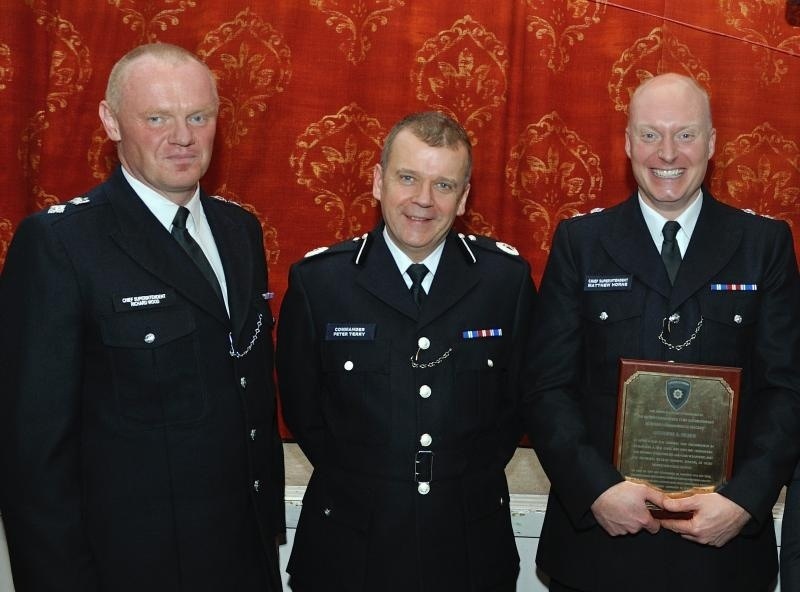 Commander Peter Terry (QPM), who is in charge of Public Order command Unit, presented an award to Inspector Jeoff Bull who is the assigned liaison Police Officer at Stoke Newington. Inspector Bull meets with Shomrim on a regular monthly basis discussing strategy, incidents and intelligence and interacting on general management matters. 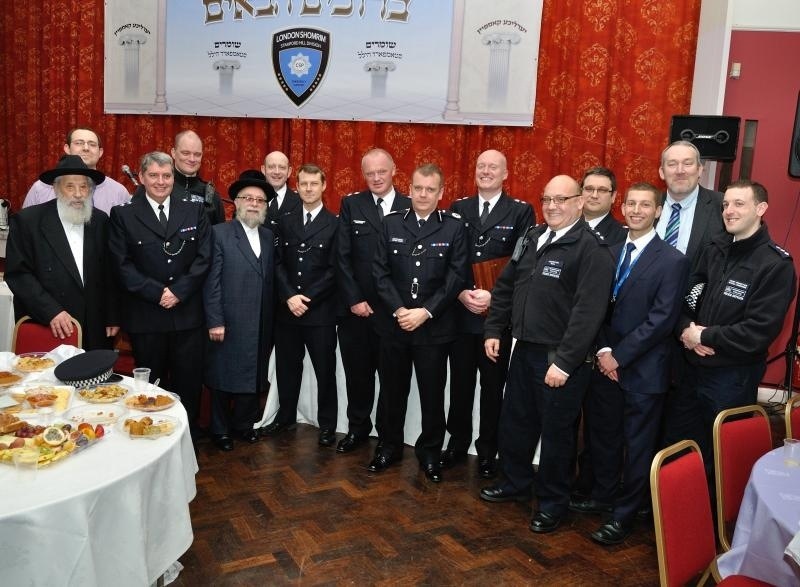 Other recipients on the evening were: Chief Inspector Matthew Mathew Schaer, Deputy Centre Manager at Bow CCC (Police Call Centre), who acts as an advisor to Shomrim; Inspector Tim Williams from the Territorial Support Group (TSG), who is also the chair of the Jewish Police association (JPA) and regularly takes volunteers on patrol with his units; Chief Inspector Michael Loebenberg, Deputy Chair of the JPA, and Detective Inspector Constable Nick Goldwater who both engaged in the monthly legal training sessions with the Shomrim volunteers. Lord Maurice Glassman, a Labour life peer at the House of Lords, also presented Awards to the Liaison and Advisory personnel Rev. Kurt Stern MBE, Reb Yitzchok Kornbluh and Reb Dov Gerber, as a show of recognition to their ongoing valued input in making the organization run smoothly on a daily basis. A letter was read out from the previous Borough Commander of Hackney Police and Current Deputy Head of Hackney Safer Communities – Mr. Steve Bending, who expressed his admiration to the successes achieved so far. It was Mr. Bending who was instrumental in the setting up process of the partnership in working together with the Metropolitan Police. During his tenure at Stoke Newington Police Station, he took the incentive of visiting the Brooklyn NY division of Shomrim and also the NYPD 66th Precinct in Boro Park where he was a special guest at a reception in his honor. 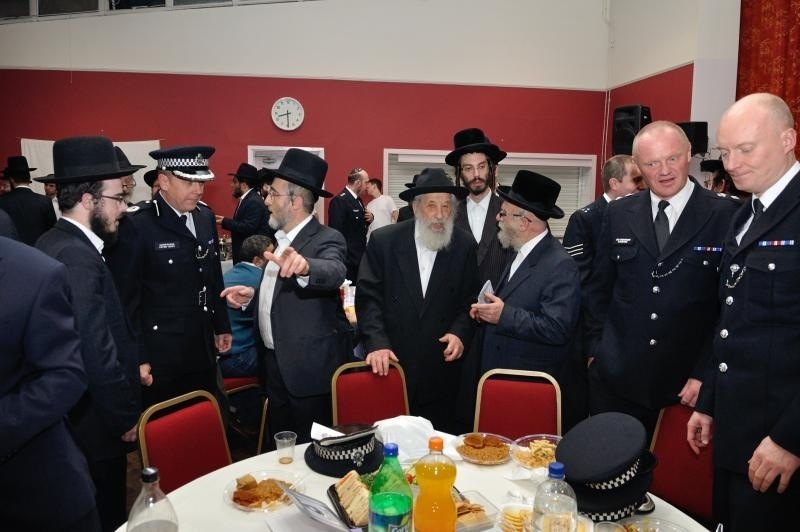 The event also attracted a raft of community leaders and activists, such as former Labour Councillor Rabbi Abraham Pinter (IAG), Councillor Abraham Jacobson (LD), Councillor Daewood Akhoon (LD), Board member of Muslim/Jewish Forum, Councillor Ian Shaerer (LD) and high ranking police officers from the Metropolitan Police. A steaming hot Buffett of scrumptious and most tasteful varieties of delicacies was elegantly laid out for service, prepared and provided by the famous chefs at Take Sixteen. The evening was also a fitting tribute to the most important segment of the organisation, the unsung heroes, the group of volunteers who act as the eyes and ears of the police and the community in order to deter criminal activity. 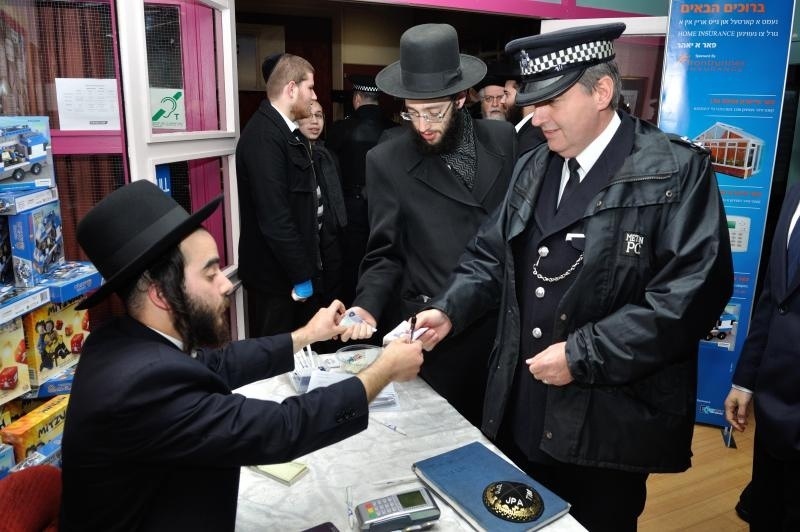 Shomrim tipped off or assisted Hackney police with 83 “direct” arrests between April and September and some 54 between October and the end of December, according to figures released by the organization at the beginning of the month. The enormous success of the evening and it’s encouraging feedback has prompted the management team to mark it as an annual feature in the communal calendar.